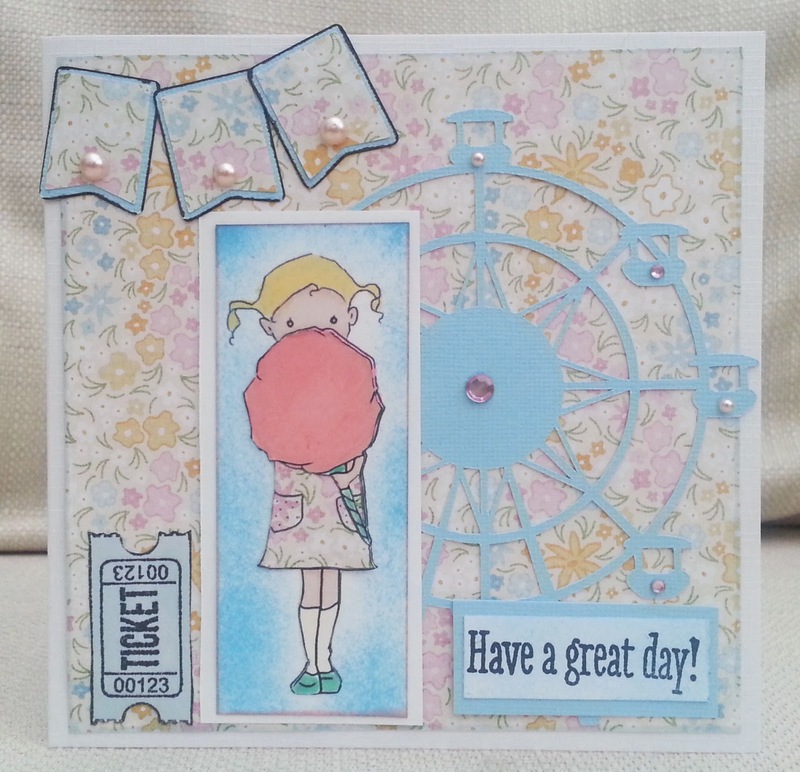 Here I used A Day for Daisies digi stamp and the big wheel was cut in Silhouette studio. The ticket and sentiment are stamps. The paper was a a magazine freebie. One of my brothers is an accountant who does triathlon and other sporty things. This is his birthday card. I used the sketch from Kathy's Waffle Sketch File and cut the runner etc in Silhouette Studio. The number stamps are Hampton Art and 7 Gypsies. Inkspirational Challenge and DT Call! You can see that I was very heavily influenced by Sandie's card! I used two very old wood-backed stamps - the woman is by Hampton Art and the cocktails are Rubber Stampede. The sentiment is a clear stamp. 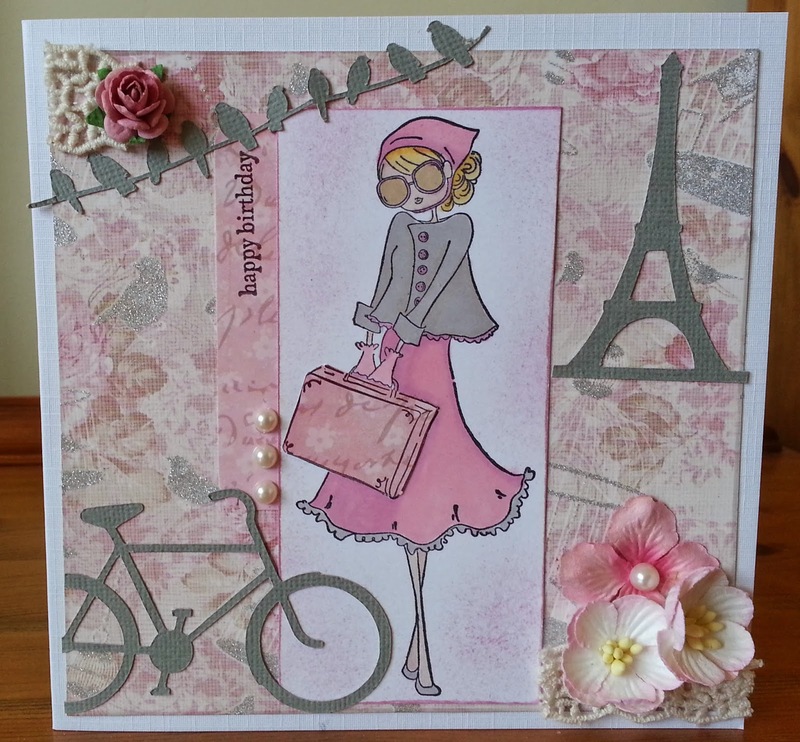 This challenge we also have a fabulous guest designer - another Sandie! Please go and see what she's done. Finally, we have a DT call at Inkspirational and we'd love you to enter. All you have to do is read the details, make a project for the challenge and add DT after your name. Struggled a little for ideas this week - thought I wasn't going to get one done- but committing to this weekly post really disciplines me! The papers and sentiment are a digital version of Echo Park Sleigh Ride and the penguin and snowflakes are cutting files, cut on my electronic die-cutter. I am soooo hybrid now! I added a touch of sparkle with some gems. Christmas Stampin fave colour combo - blue and white for Christmas again! Holly Jolly Winter scene - Penguin in snow, kids sledging in the distance - okay it's an unbelievable scene, but it's a scene! 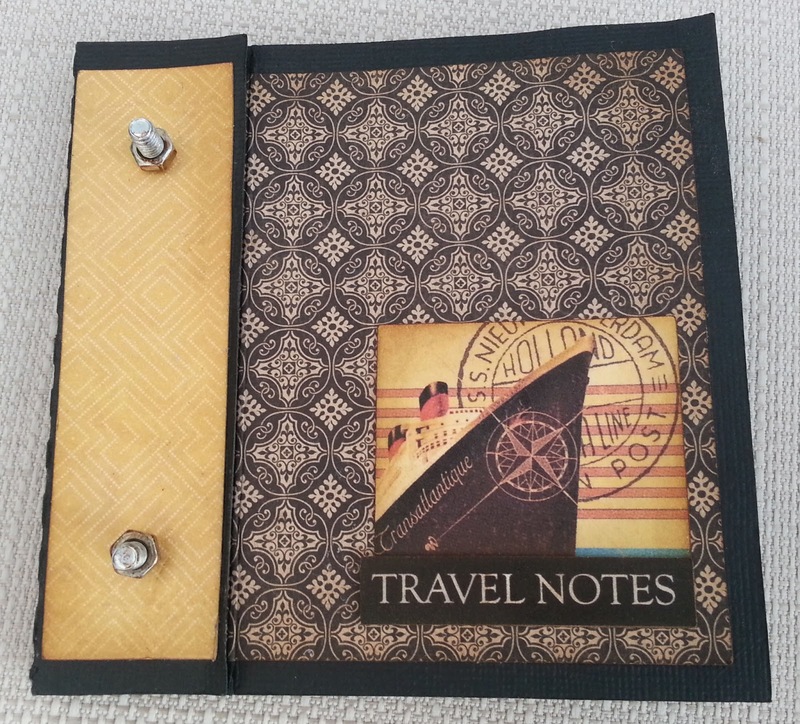 Here's a little notebook/ mini album I made using one sheet of Graphic 45 paper(on the cover), a digital version of Echo Park Transatlantique and lots of distress ink. Paula Holifield Crafts Are we there yet? 2) I got carried away and forgot the 'max 5 challenges' rule . I like the Artful Times challenge - they often have more unusual themes and they have a small, friendly DT . So I've gone back to the drawing board and had another shot. 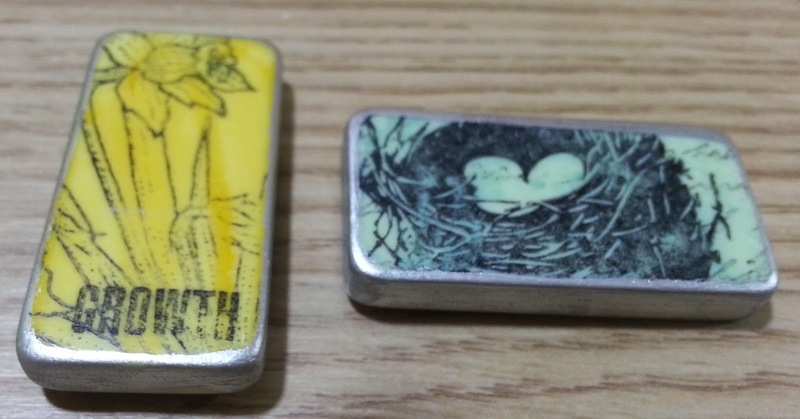 These are my favourite two of the 14 dominoes I stamped (not joking!). 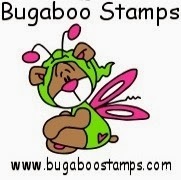 I used Promarker pens for the coloured backgrounds and Staz-on for the stamping. The daffodil stamp is an unknown UM and the word 'growth ' is from 7 Gypsies Numero set. The birds nest is from a clear set (lost packet again) and the script is Indigo Blu. I ran a Krylon silver pen around the edge. I love grey at the moment. Here I am using it again, this time to stamp this Mary Poppins silhouette by Lost Coast Designs. 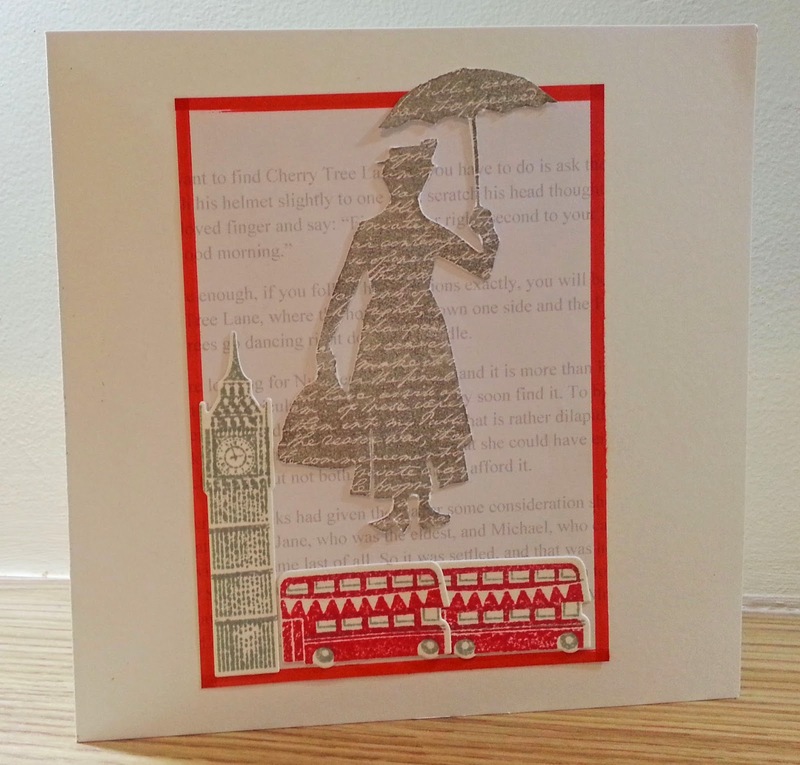 The buses and Big Ben were sent to me by my lovely blog friend Sandie . The background is the first page from the book 'Mary Poppins'. There's nothing crooked about my card - just my photography! This is the second time I've used this Stampin Bella stamp that I bought in February - well done me for getting some use out of it! Belatedly,I upload the card I made for my daughter's birthday - it was on Valentine's Day, hence the heart. She was having a party with her friends in a circus-themed restaurant and I took this idea and was inspired by one of my favourite pictures ( Miss Lala at the Cirque Fernando) to feature a trapeze artist. 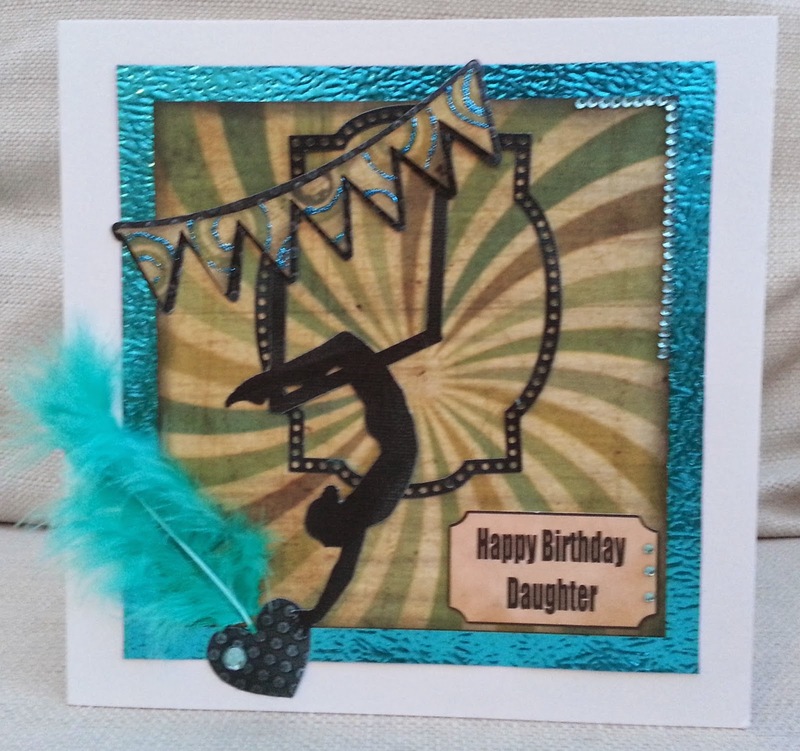 The trapeze artist was digitally cut from an SVG border file, then electronically cut on the Silhouette Cameo. I also cut the frame, heart, bunting and the sentiment shape (after typing in the sentiment). I added shimmery paper, glitter, background paper (Tim Holtz) , gems and a feather and I embossed the heart. 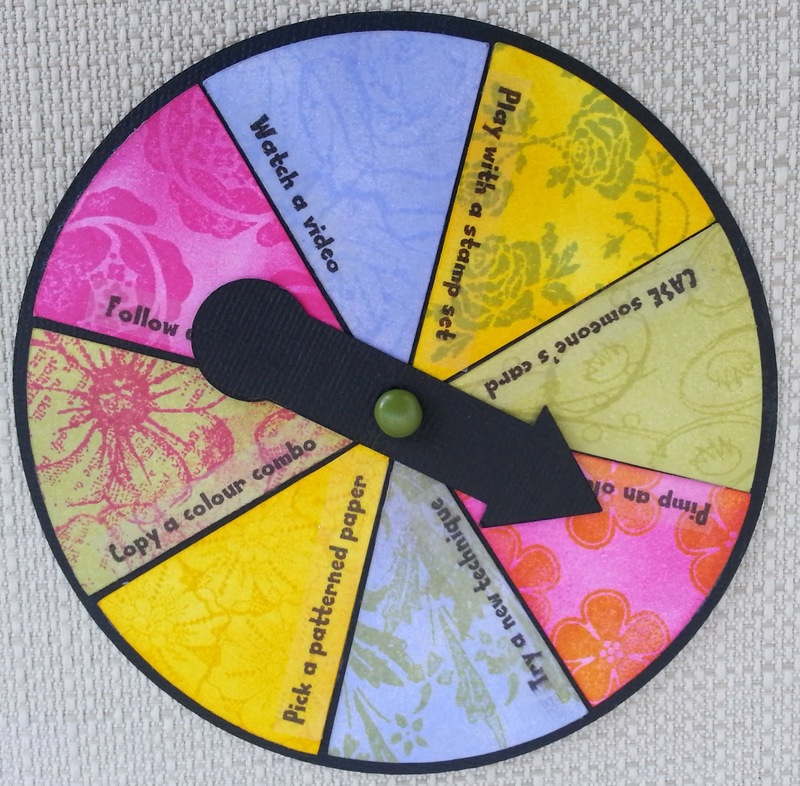 I was inspired to make this project by the 'Game Pieces' challenge at Artful Times but looking back at their blog now, I'm not sure I 100% followed the brief - maybe I should have altered an existing game piece. I made it using my elctronic die cutter and a cutting file from the Silhouette store - I'm sure you could do this by hand if you had very good cutting skills (which I don't!). Although this looks multi-coloured, I only used four Distress ink pads plus black and white cardstock. I used a flower stamp by a different company for each segment. I printed the words onto Safmat clear film. There are lots of challenges on at the moment for green cards, due to St Patrick's Day, so I stole the idea for a Christmas card. 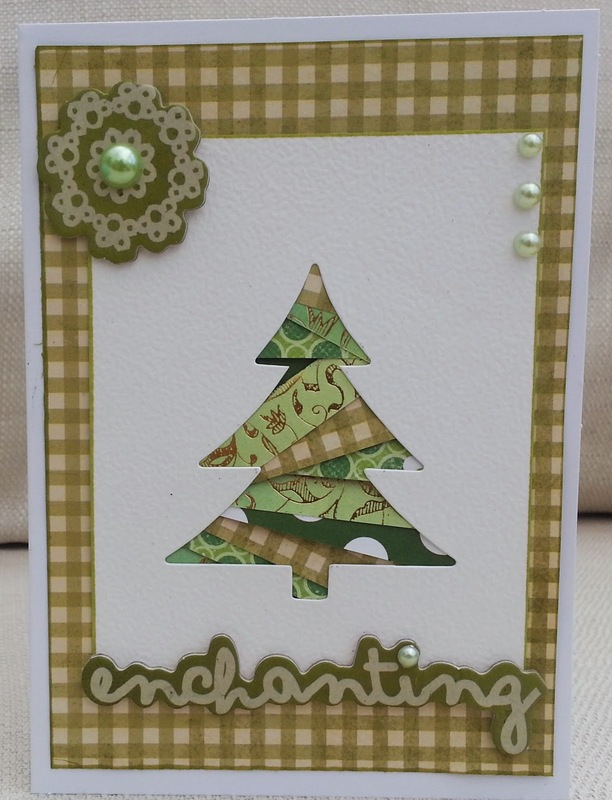 For this card I had an aperture of a Christmas tree and I covered it using strips of scrap patterned paper. I didn't use any technique! I added two chipboard pieces and some greenish pearls. I really like the free sentiment stamp with this month's Craft Stamper Magazine. 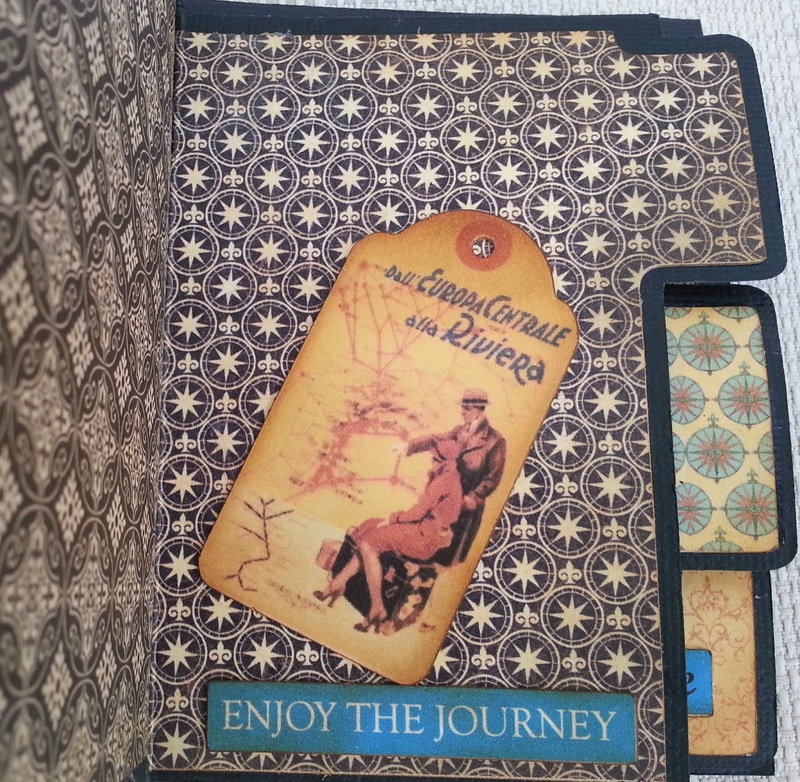 I used it on this card with elements and papers from Fancy Pants' Park Bench range. Actually, only the scrap of floral paper on the bottom was from an actual paper pack. The frame and the pattern on the flowers were all made with a digital version of the set. I brought them into the Silhouette Cameo and made the frame into a Print and Cut file. I used the 'fill pattern' tool on a flower cutting file and the bird is a cutting file from SVG Cuts. I inked everything with 'Antique Linen' as I often feel home-printed papers look a little too clean! You can clearly see my influences, I guess! 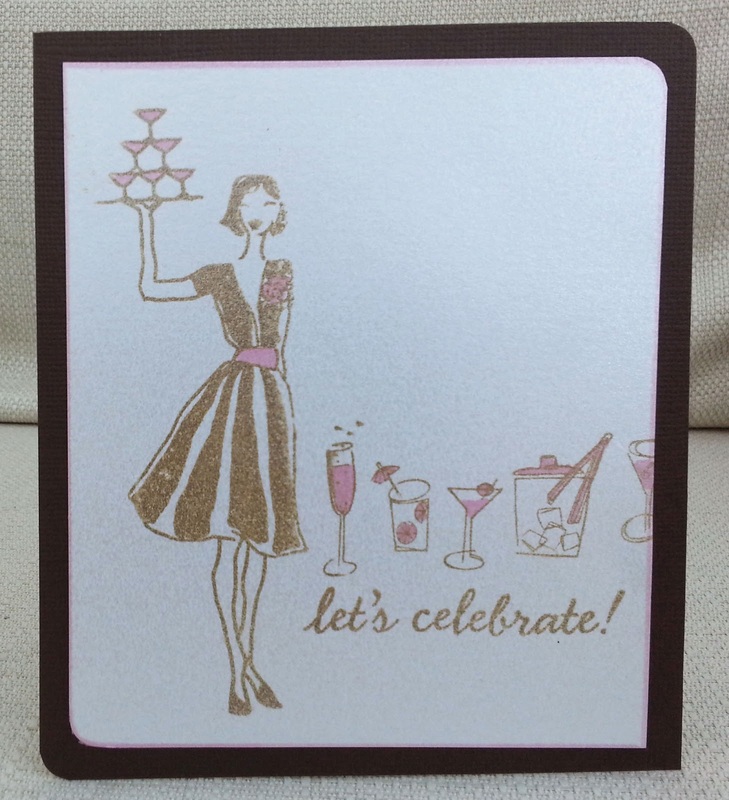 I composed my card using a digi kit in Craft Artist, printed it, and embellished it. How does the photo influence you? 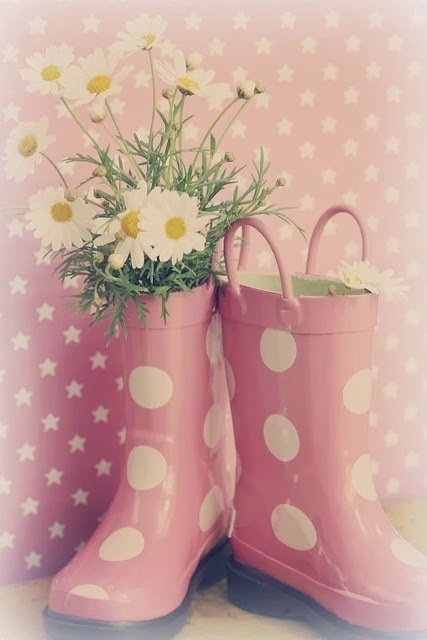 I doesn't have to be as obvious as mine - maybe pink with spots or stars, or the flowers. We have some fabulous sponsors, so come over to Pinspirational and join in. Here's a card that took much longer to design than to make. It's another 'challenge Mum' from my daughter. 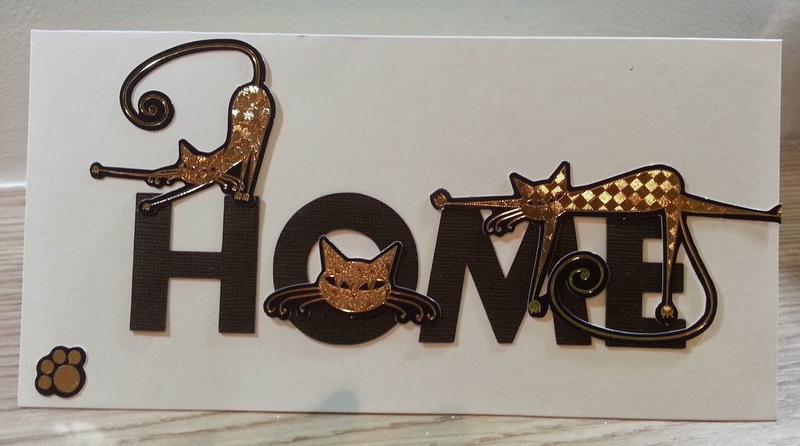 She wanted a new home card for her cat-loving friend. The letters were cut on my electronic die cutter and the cats are foiled die-cuts from Hunkydory. Regular visitors to 'My Perfect Life' may remember me saying that, much as I love to enter blogland challenges, my greatest challenges are set by my dear daughter. 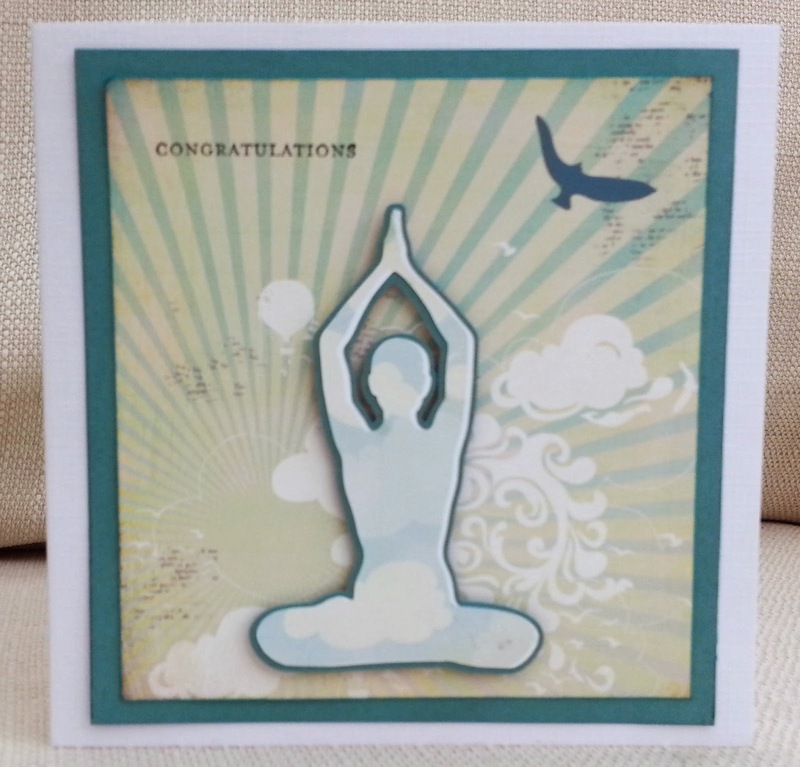 So, at seven o clock this morning I was able to text my daughter and say 'your yoga card is ready for collection '! Two of my lovely team-mates from Inkspirational have started their own challenge blog Time Out . Their theme is 'Dancing in the rain' and here's my take on that. 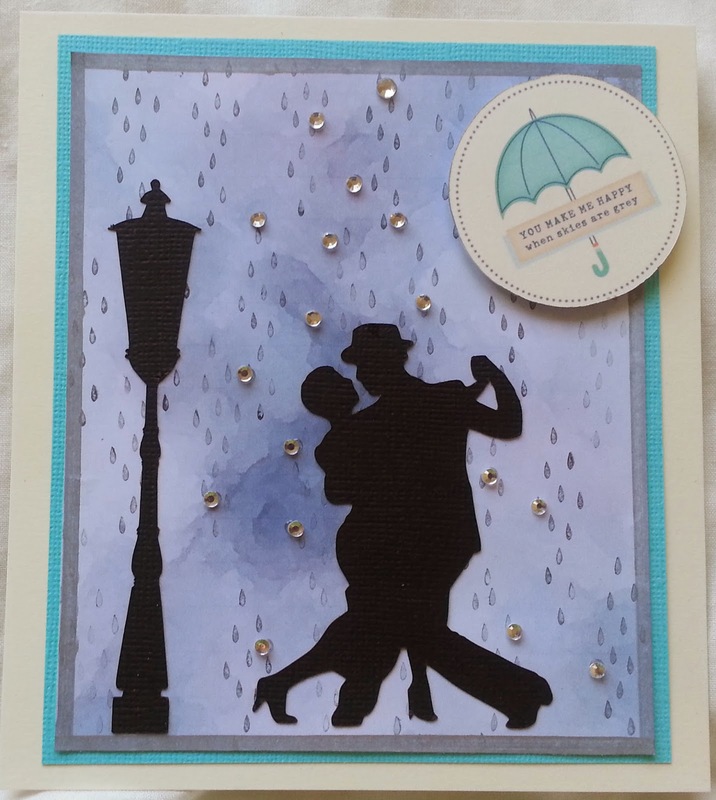 The silhouette of the dancing couple and the lamp-post were from two different My Craft Studio cds and I imported them into my Silhouette Cameo and die-cut them. 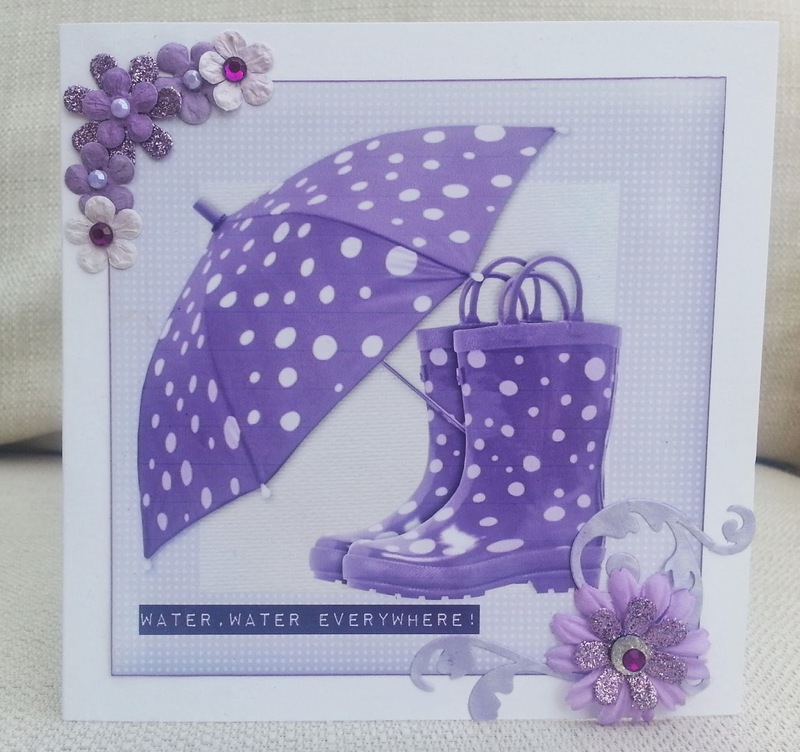 The background was printed off from somewhere else and I stamped it with raindrops from a Stampin Up stamp. The die-cut with the umbrella and sentiment is from an American Crafts digital collection and I added some adhesive gems. 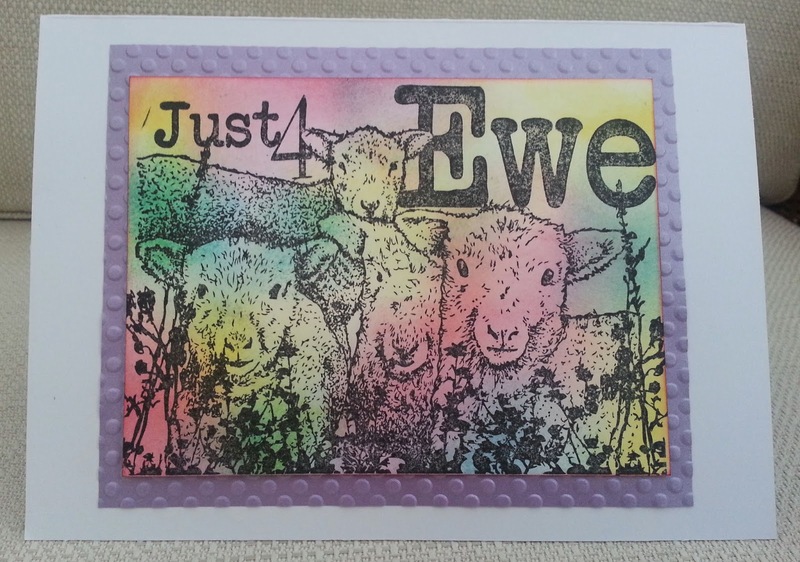 You can see I've been quite unimaginative and used the idea of both the sheep and the colours. I used a Joanna Sheen stamp and multiple colours of Distress Ink pads and sponges. 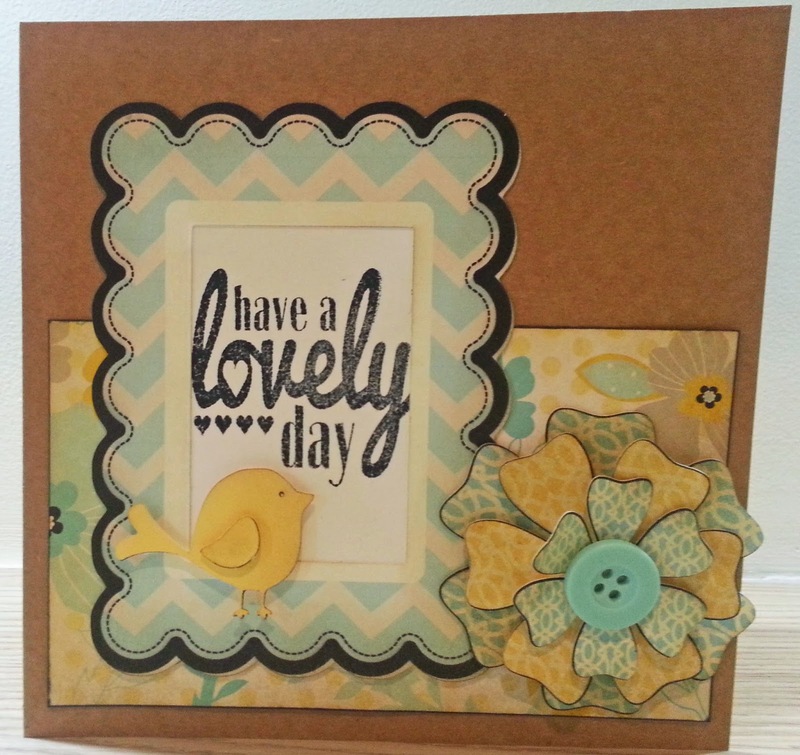 This time we have a great Guest Designer, Gerrina , so please check out what Gerrina, and the Inskspirational DT have done, and have a go yourself. I've not had much time to craft this week - having a heavy week at work and also building work at home, I've been struggling to stay awake past 9.30! So I've made myself stay up tonight as I feel grumpy when I don't get time to craft! The geisha and the background paper are from Debbi Moore oriental CD and I decided to grunge them up. 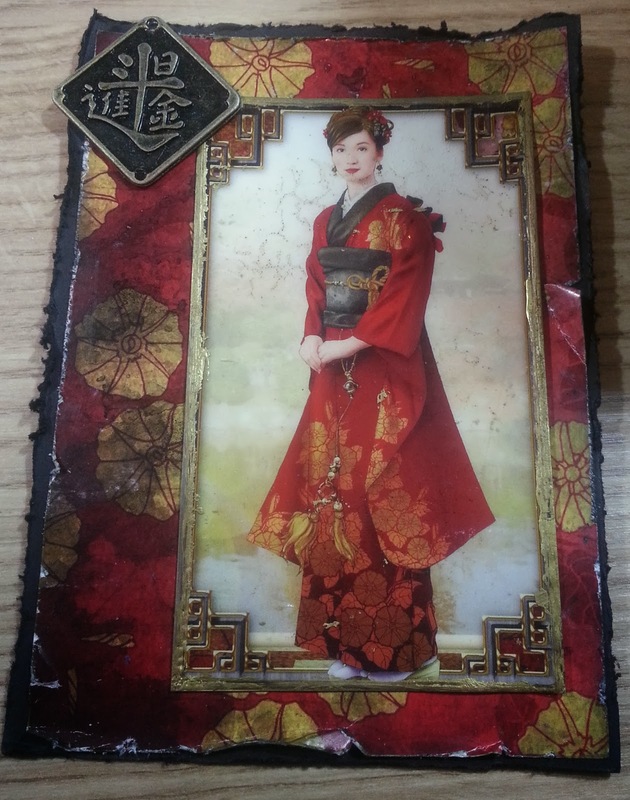 I sponged 'Antique Linen' ink pad over the geisha image and then melted multiple layers of clear embossing powder over the top. My intention was to crack it but it wouldn't crack!! So instead I randomly stamped a crackle stamp over the top of the ep. I coloured the edges with a gold pen. I crumpled up the background paper and distressed it using black ink, water and a distresser tool. I added an oriental charm that was part of a lovely prize package I won a while back from CD Sunday . I have no idea what it says so hope it's not inappropriate! Does this card look Christmassy to you? I can't decide! 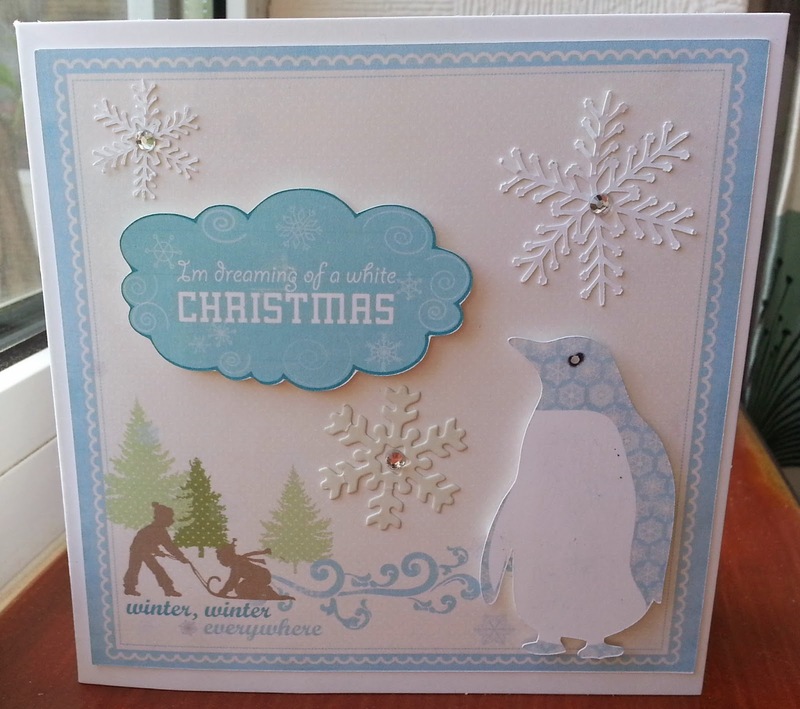 The stamp, the papers, sticker and die-cuts all came from Christmas ranges but still... I actually made this while at my local scrapbooking group and when I asked if it looked Christmassy, one of the women said - 'Well it will look Christmasssy at Christmas!' . Maybe she has a point. So, the stamp is Molly Bloom, the die-cuts and stickers are from a magazine ( years old) and I used markers, glitter glue and gold liquid pearls. 'Housework fascinates me...I could watch you do it all day long'. I covered an MDF tag with ripped papers , gesso, masking and ink spray. I printed the sentiment and the sticker is by October Afternoon. Week 8, and I'm looking around the Christmas card challenges to help me keep coming up with ideas. 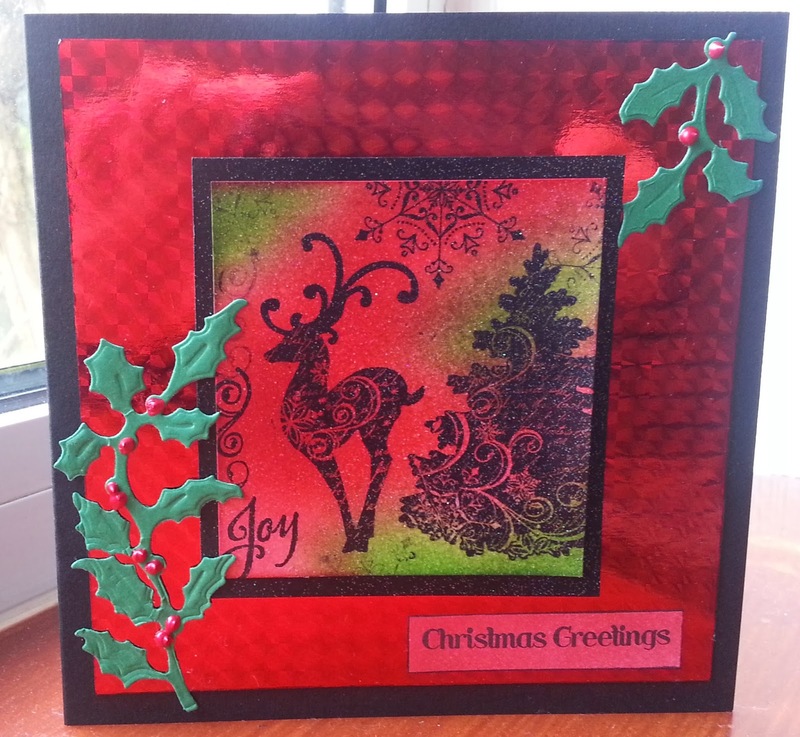 This week Holly Jolly Christmas Challenge had the theme 'reindeer' and a couple of their DT linked up to my last linky. (Thank you!) They used cute reindeers so I thought I'd do something different. I made a background by sponging red and green inks, then stamped it with stamps from a set of stamps I got free with a magazine ages ago. Then I sprayed it with glitter varnish ( and nearly knocked myself out with the fumes!) . I mounted it on patterned mirror card ( can you spot me in the reflection?) and added die-cut holly with liquid pearl berries. For my DT card I used a digi called Deacon Swing, kindly provided by our sponsors, Bugaboo. I printed it onto kraft card, coloured it with gel pens and paper-pieced the Tshirt. 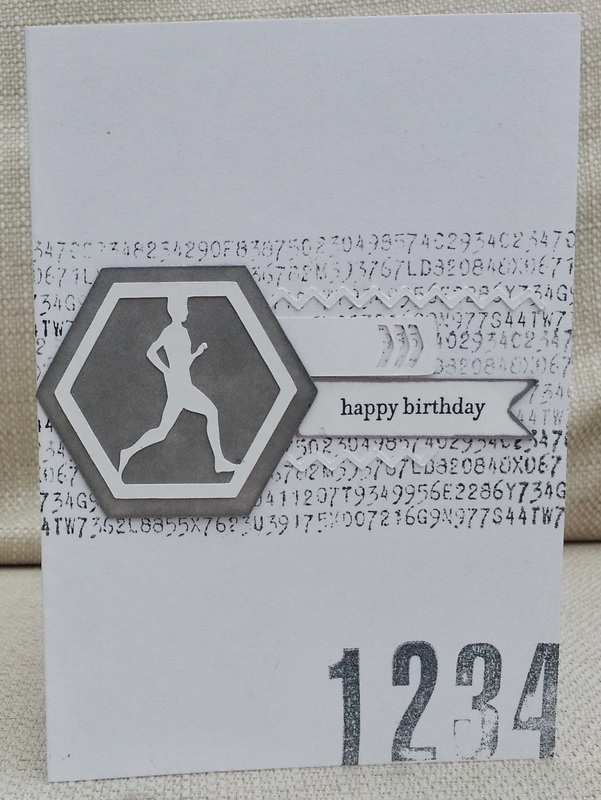 I made a gatefold card with an aperture, covered it with patterned paper and added buttons and a birthday sentiment. (In real life the buttons are pretty much the same colour, I don't know why in the photo one looks pink!) . 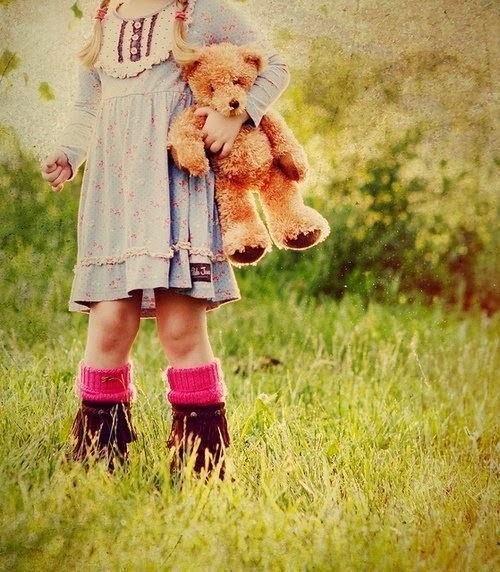 What ideas does the photo give you - children, teddies, toys, green (the grass etc) ...whatever it does for you, I hope you'll have a go and join us at Pinspirational. It's been so long since we had a girl born amongst our family and friends that my son asked me (when 6) if all babies were boys! Never mind, if one comes along , I'm ready! This image is from Lili of the Valley and the sentiment is from..er..somewhere else (lost packet again). I stamped some hearts from Greeting Farm ( I won this stamp a while back) onto pearlised card for the background and also used a paper scrap, which I also used to paper-piece the blanket. An extra Christmas card this week because I want to enter the 'Winter Olympics' challenge at Winter Wonderland. This stamp is a very old UM , maker unknown. The paper is a scrap left from a freebie paper pack and I traced some of the swirls with a Versamark pen and embossed them. 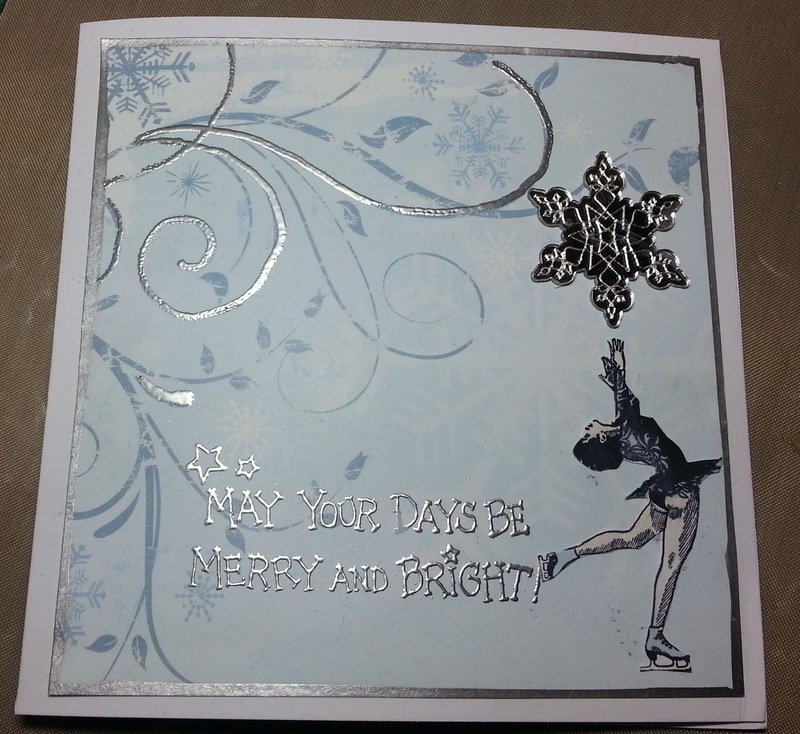 I also heat embossed the sentiment (Hero) with silver EP and added a mirror snowflake. I was trying something different here - inspired by a picture I've seen of stitched lines and semi-circles. I didn't quite achieve the effect I was going for, but I quite like it anyway. Expect to see the idea re-visited! 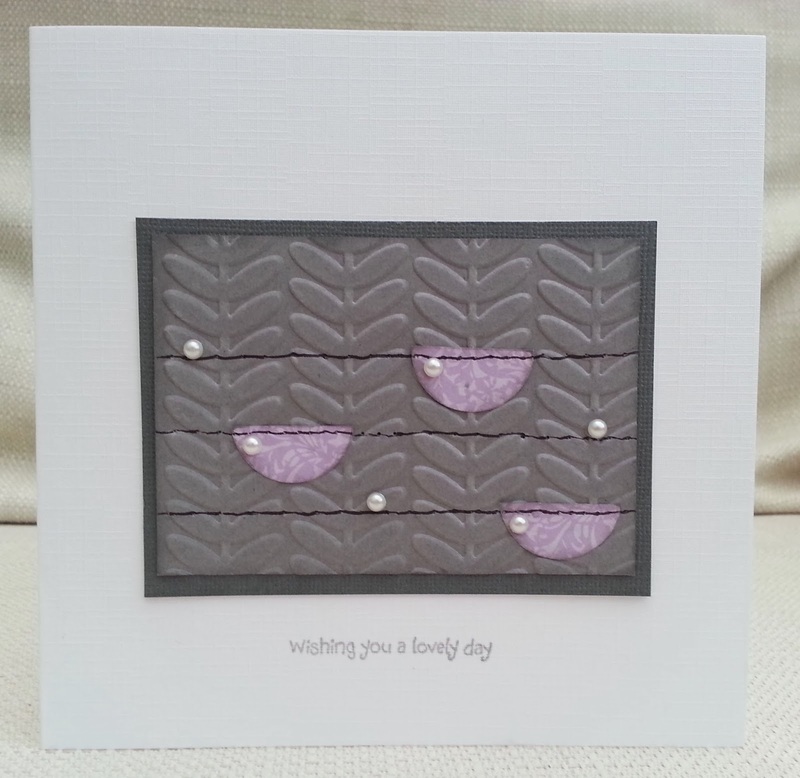 I used two shades of grey card, patterned paper scrap, circle punch, embossing folder and pearls. I attempted a stitching effect with paper pricking and pen. I couldn't use my sewing machine because a) I can't get to it as it is hidden behind the contents of my kitchen (getting new kitchen fitted) and b) I'm a coward! 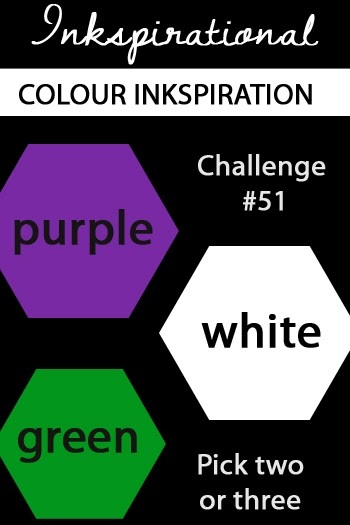 It’s time for another challenge at Inkspirational and this time, it’s a colour challenge – purple, white and green. You can choose to use any two, or all three of these colours. This week we have been joined by a fantastic guest designer, Cathy. 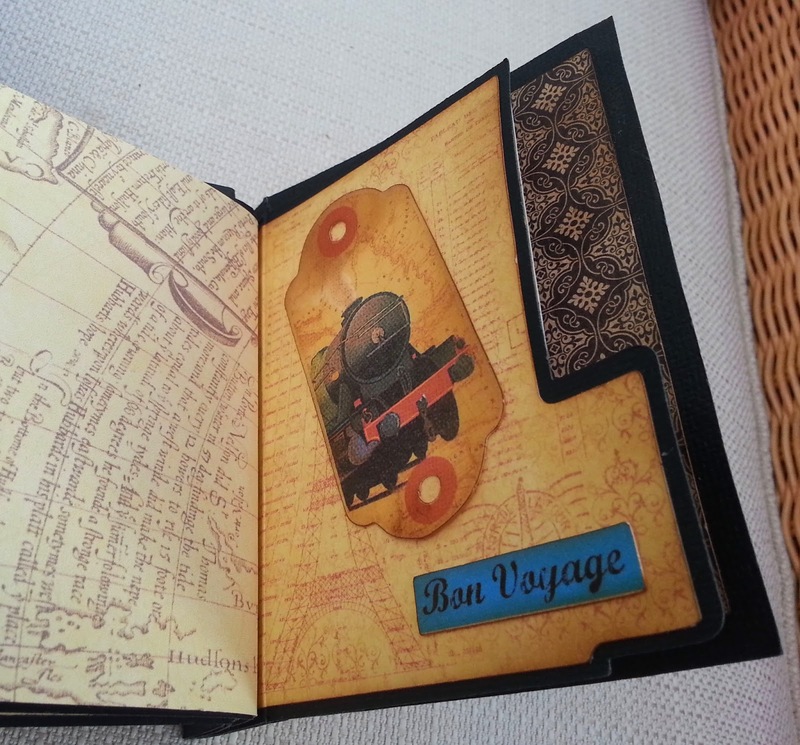 Please visit her blog and the Inkspiration Challenge blog to see her lovely creation. I chose this colour combo because it’s International Women’s Day on March 8th and purple, white and green were the campaign colours of the Suffragettes, who fought for votes for women in the UK. 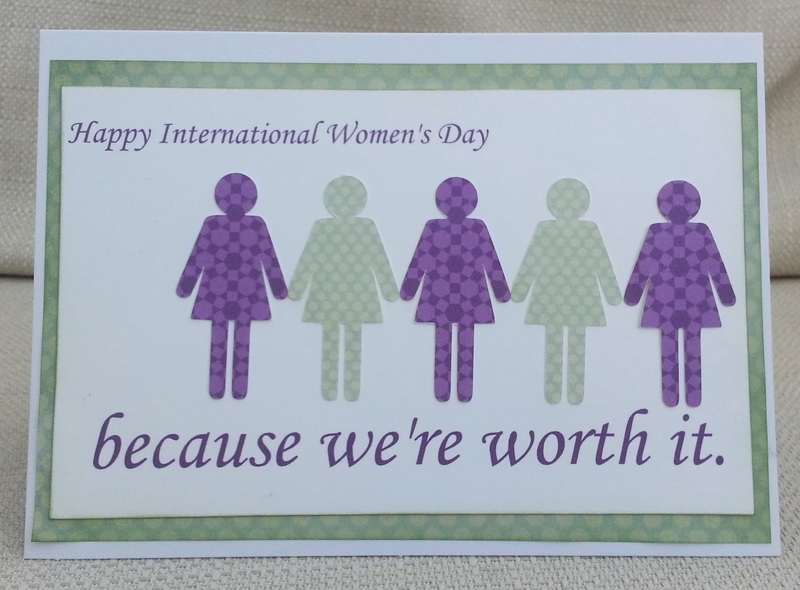 For my card, I kept it very simple, parodying a well-known cosmetics advert and using die-cut ‘women’. 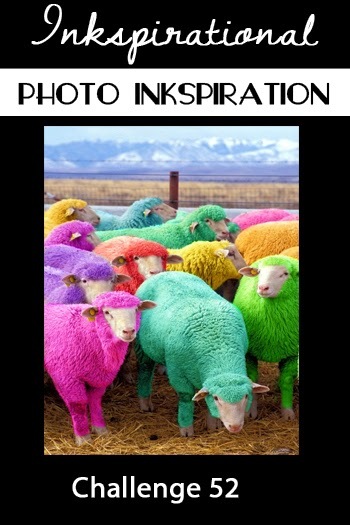 Please come and join us at Inkspirational and show us what you can do with purple, white and green.